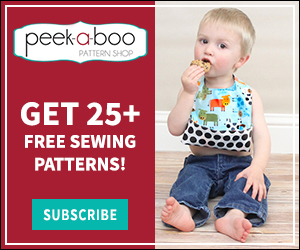 Embroidery 101 - Peek-a-Boo Pages - Patterns, Fabric & More! Hi all, it’s Genie from the Sew and Tell Project, and I’d like to talk embroidery with you. The world of embroidery (or needlepoint, or whatever you like to call it) is as vast as is the world of sewing. 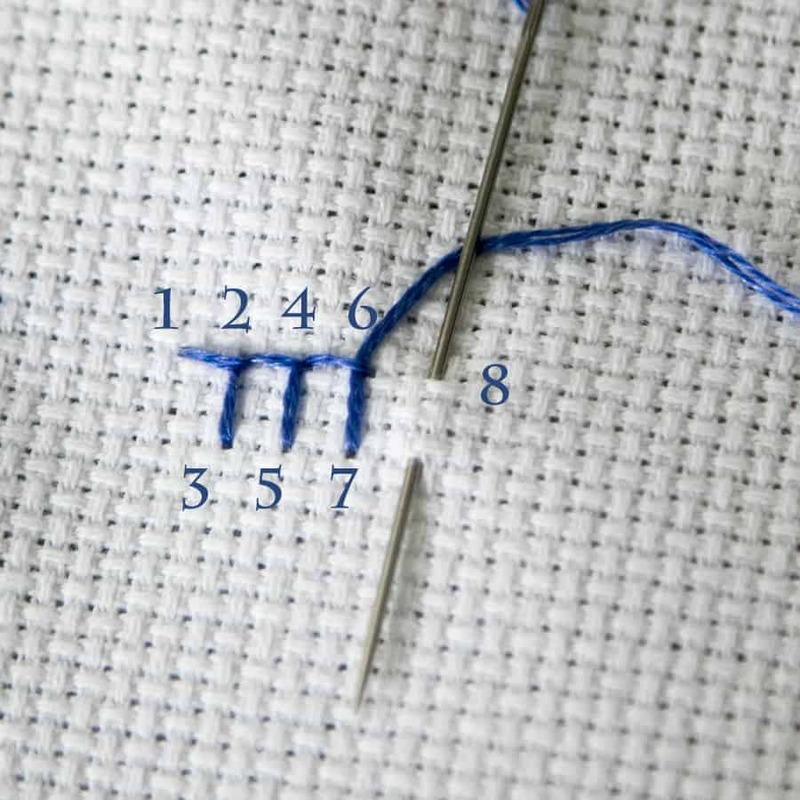 There are many, many stitches, and variations of stitches, and combinations of stitches…it’s nearly endless! In my next several posts, I’d like to give you a basic introduction, with some fun applications and a bonus sewing project. Needlepoint is a more specific type of embroidery. While the definition uses the term “canvas,” needlepoint can readily be done on any type of evenweave fabric, such as canvas, linen, and specialty fabrics like Aida and Lugana. Embroidery, while still done with needle and thread, can be added to any type of medium that you can punch a needle through. Embroidery has been around in some form almost as long as people have been working with cloth. In fact, fossilized remains of hand stitched clothing have been found dating as far back as Cro-Magnon times! Highborn ladies spent much leisure time stitching tapestries that would become wall or bed hangings, or cushion covers in the Middle Ages. This is a portion of a sampler I stitched (I’m sorry, it really needs a good wash, block, and press!). 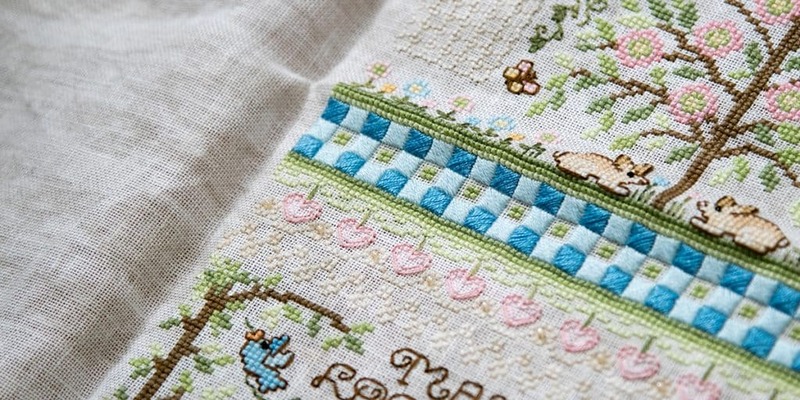 It is primarily cross stitch, but uses several specialty stitches to make the design interesting. I chose this for my son’s birth sampler because I loved the soft colors and the whimsy that the specialty stitches and beads add. This is stitched on a gorgeous 32 count vintage smoky white linen. The hand dying is subtle, but adds a beautiful finish to this piece. The design is called Grace and Love Birth Sampler, by Stoney Creek. There are many types of embroidery. 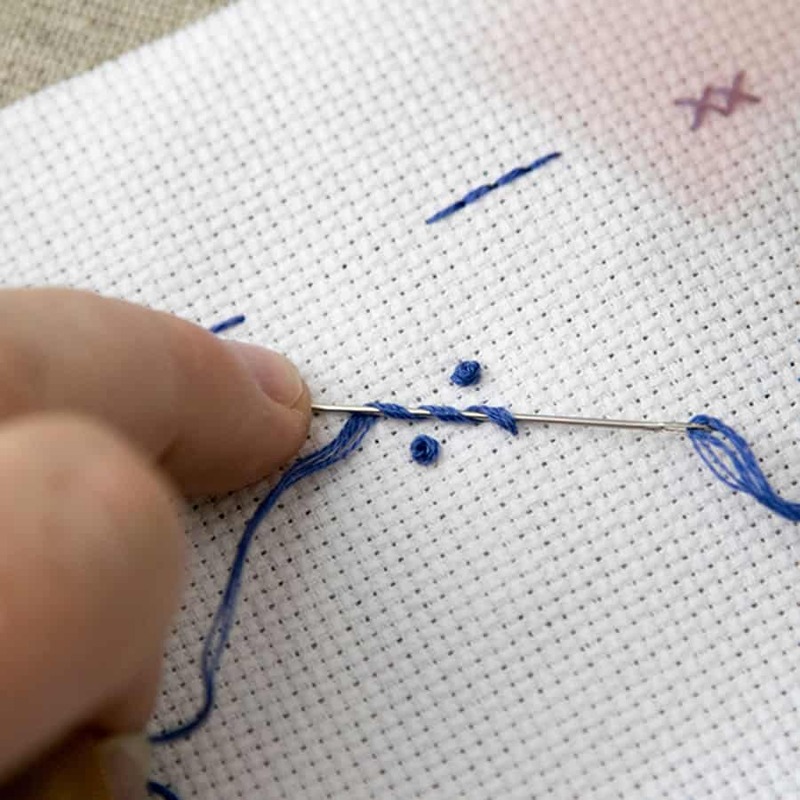 Cross stitch (stitches that look like an x), candlewick (whitework), crewel (yarn), hardanger (whitework using drawn threads), and cut work (threads in between tightly worked stitches are removed) are just a few. Embroidery can be done on many surfaces, and with many mediums. Cotton, silk, and rayon floss, silk ribbon, perle cotton, crewel yarn, and many other specialty threads. Here are a few that I’ve worked with. These are all cotton flosses, and two of my organization methods. I wind all floss onto bobbins, to store in these boxes when not in use. They go into plastic bags on a ring for projects; they are easy to toss into a project bag this way. At the bottom, you see a variegated thread. 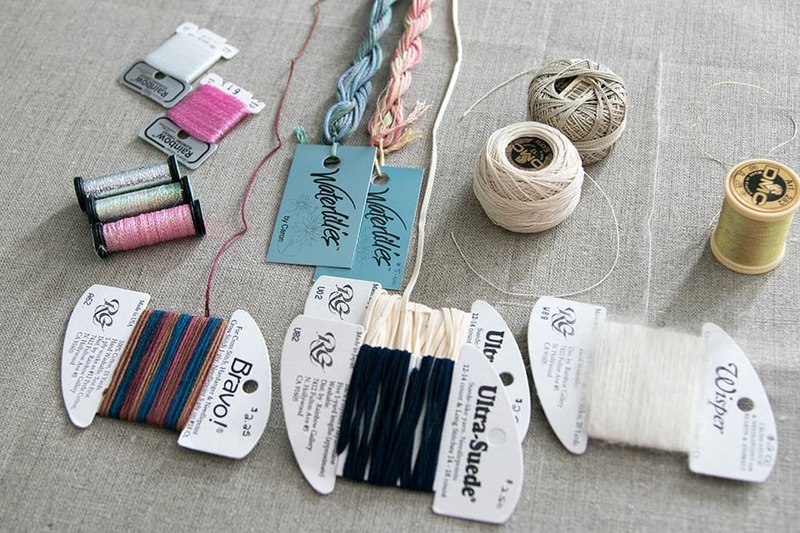 Variegated threads produce a multi-colored, gradual effect as you stitch. Above, I’ve also pictured a few important tools: a small, sharp pair of scissors, a disappearing ink pen, and some needles. Tapestry needles come in different sizes. The most commonly recommended size is 24. I personally like a longer needle, though. Definitely experiment! Gold plated needles are great for preventing tangled thread. Finally, many projects call for the addition of glass seed beads, and you’ll need a beading needle, very long and very thin, for those. At the top left are several types of blending thread (these can be difficult to work with). They are thin and sparkly, and are usually used with cotton floss to provide a bit of sparkle in the project. Next, is a handpainted silk floss; this particular brand is variegated and has a beautiful, soft shimmer. The spools are perle cotton in two thicknesses. These are often used for hardanger and cutwork. All the way to the right is a spool of very fine gold thread. Across the bottom are a few novelty threads. The first is a variegated yarn, second is two colors of “Ultra-Suede,” a flat, suede thread. Last is Wisper; it’s kind of difficult to work with, but gives a soft, fuzzy effect. The two photos above use a natural 32 count linen as a background. That means that there are 32 threads per inch. Linen is soft and the threads aren’t quite even. The irregularities can really add to a design…and can really mess with your counting! All of my stitch illustration photos, below, are done on a 14 count white Aida cloth. Aida is a stiffer even weave fabric ideal for cross stitch. It’s very evenly woven and the holes are quite distinct. Canvas can be used for heavy duty projects such as tapestry, cushions, purses, or rugs. Fine linen, muslin, silk, or any fine, even woven fabric, can be used for décor items. 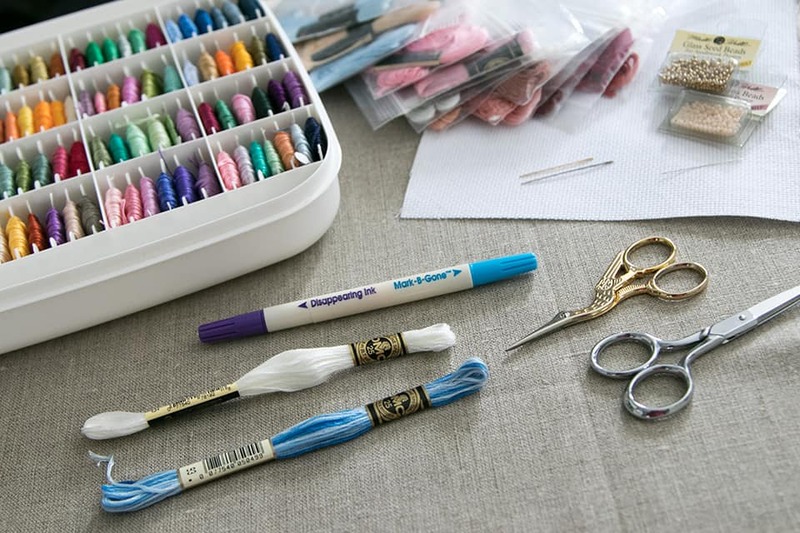 As far as supplies, you’ll need a design or chart, fabric, thread, needle/s, and scissors. A good disappearing ink pen is useful to transfer your design to your fabric. A hoop or frame is used to hold your fabric taught while you stitch, which helps to provide even tension. 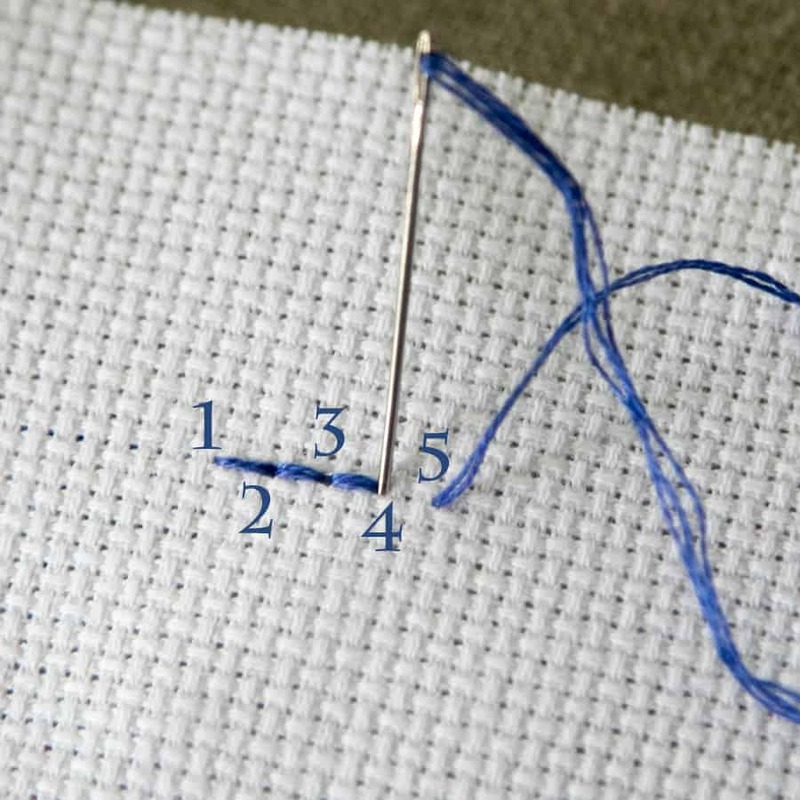 I’m going to close this installment with five basic stitches. First, is the running stitch. 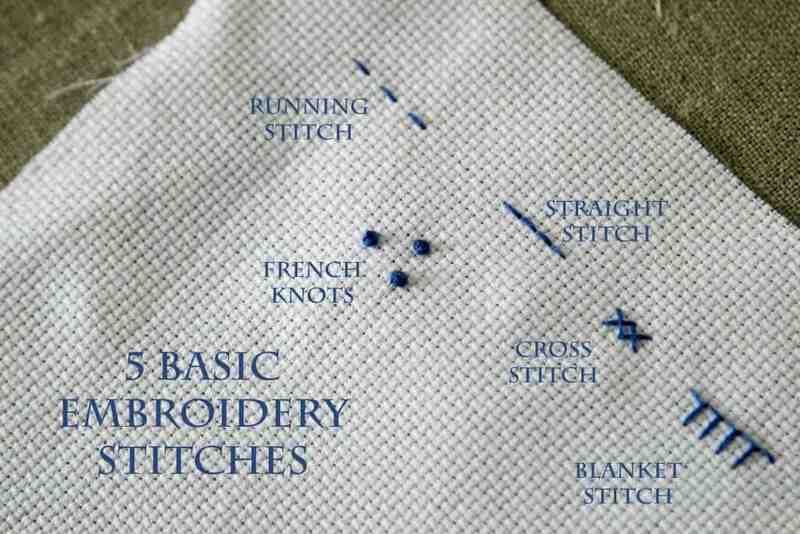 It’s a very simple stitch, usually used in borders. The stitches are even, as are the spaces in between. This stitch produces a dashed line. 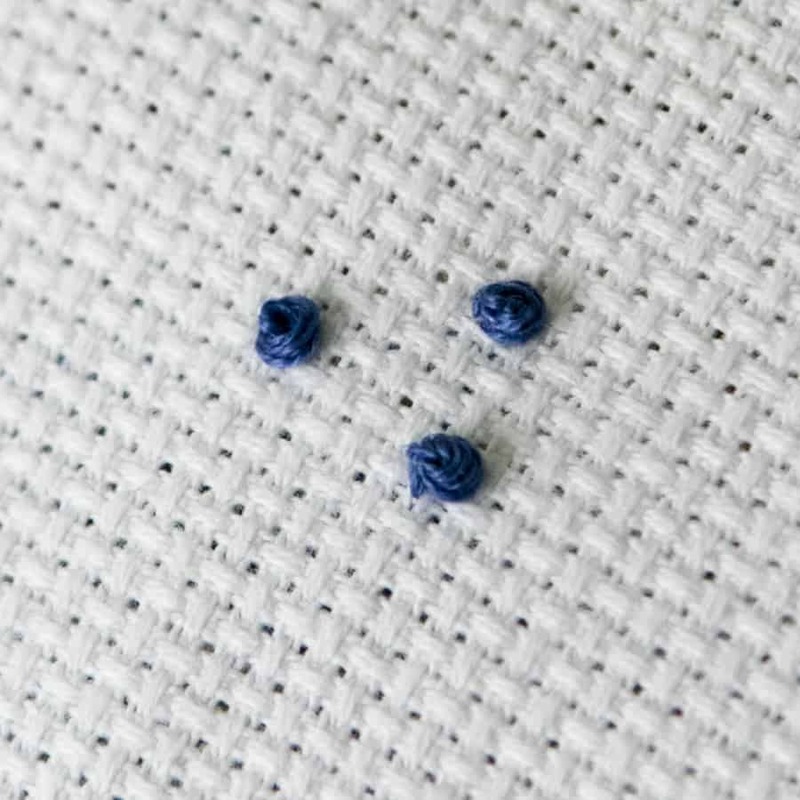 The backstitch is often used to outline areas within a design, or to add design elements such as letters or vines. The needle initially comes up at 1 and goes down at 2. You then bring the needle up at 3, and down back at 2. Up at 4, down at 3; up at 5, down at 4. This gives you a solid line. 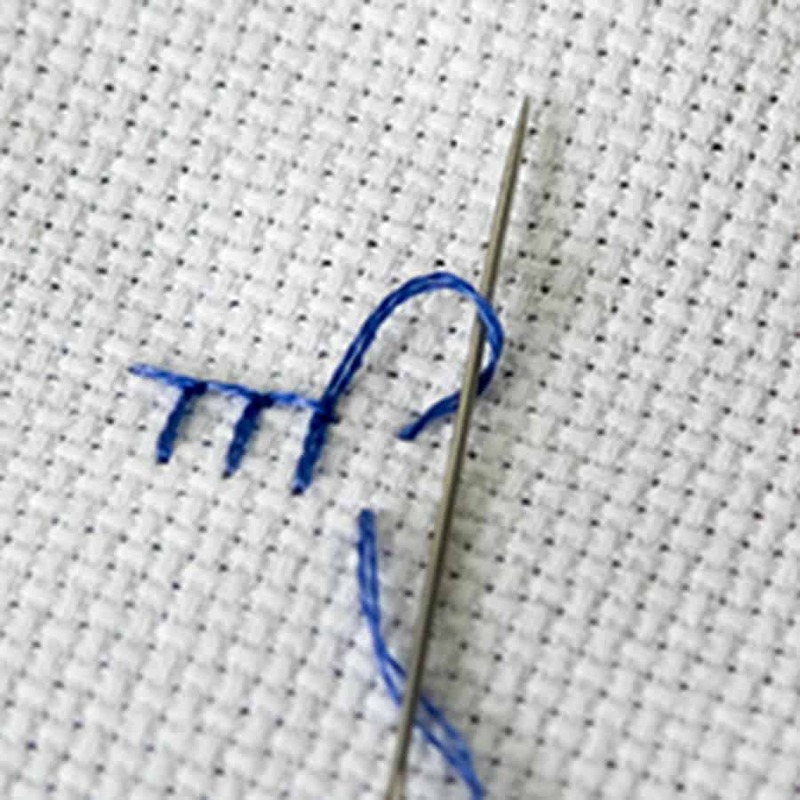 A cross stitch, as its name implies, is actually two stitches in the shape of an X. This stitch is often used to fill in larger areas, and can be quite elaborate when combined with multiple thread colors and back stitches for definition. Your needle will come up at 4, down at 2; up at 5, down at 1. This is one completed cross stitch. Honestly, the order you do the steps doesn’t matter as long as you are consistent for every single cross stitch in your piece. 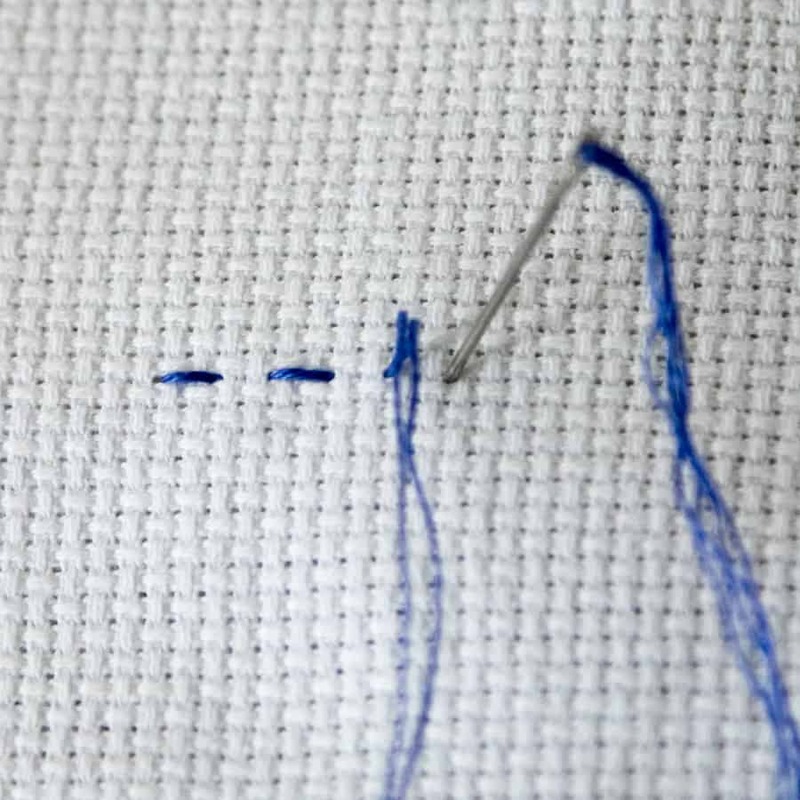 A blanket stitch is most commonly used to reinforce the edge of thicker, unhemmed materials, like a flannel or fleece blanket. I use them to close felt dolls, too. They do have a decorative aspect, too, and you may find them in some designs. Your needle will come up at 1, and go down at 2. Don’t pull the thread all the way through; leave a loop. You’ll next come up at 3, link the thread through the loop you left in the last step, and then come down at 4. Snug up the previous stitch, and leave a loop to link the next stitch through. See below for the loop. I think French knots are the hardest stitch to master, and I’ve done a lot of embroidery over the years! I can’t tell you how many times my knot has disappeared because I’ve pulled too hard or too fast. So, my best advice is to take it slow, and practice, practice, practice. I don’t like to take my needle back into the same hole I brought it up through, so I’ll try to catch a little of the fabric in between to help anchor the knot. 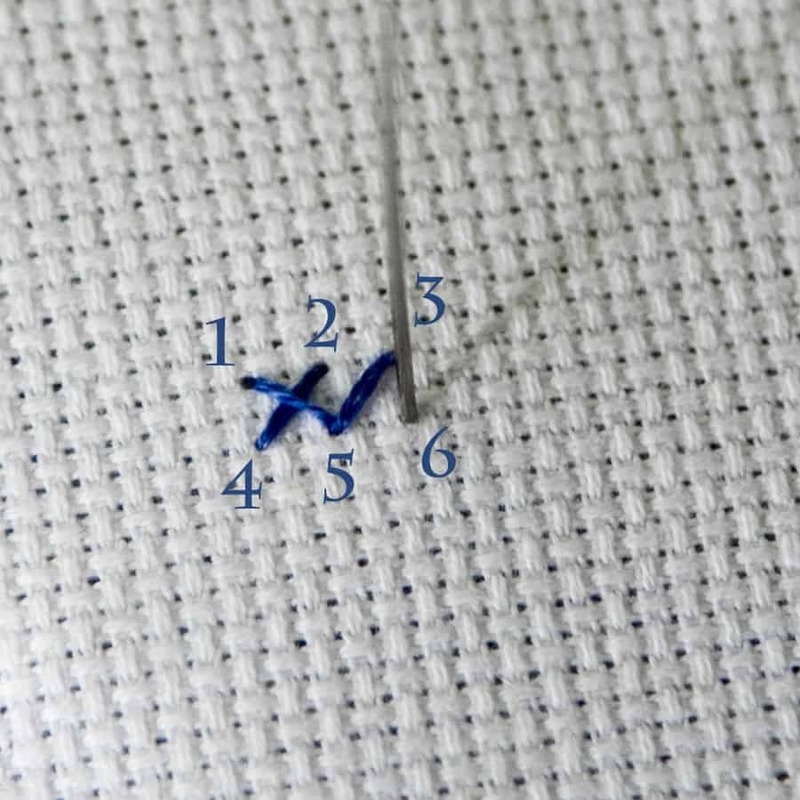 So, bring your thread up through the fabric and wrap the thread around the end of your needle 3-5 times. Insert the needle back through very close to where it came up. Smoosh your loops down close to the fabric, being careful that you don’t lose any of your wrapped loops. 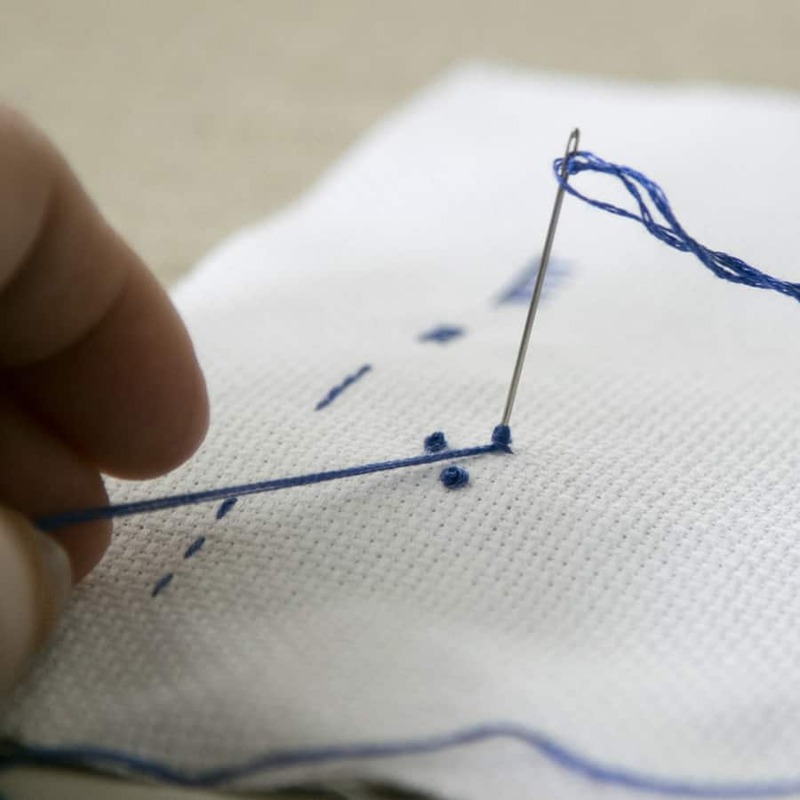 Pull the needle through to the wrong side of the fabric slowly, maintaining an even tension with your other hand on the right side of the fabric. When the tail begins to disappear, go very slowly. It’s so easy to pull the knot through at this point. Do not pull past the point where the thread disappears into the knot. Voila! But seriously…practice. These are enough to make me put a project away for a few days! 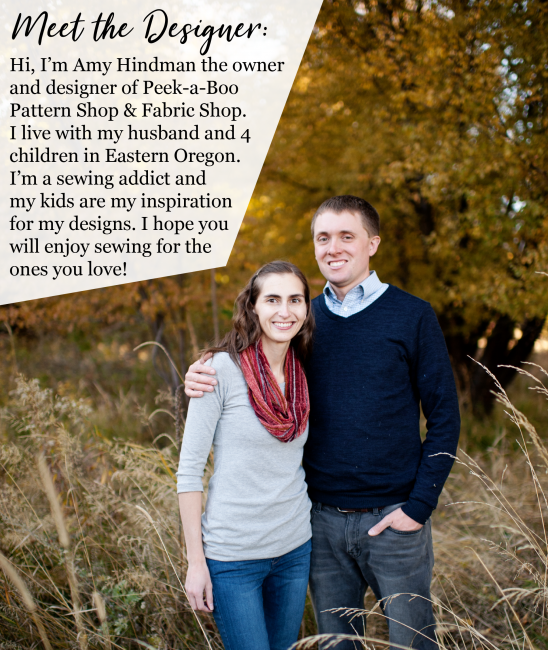 My next post will have a some stitching tips I’ve picked up over the years, more stitches, and some links to free patterns. Later, I’ll also be going over practical applications…not everything you embroider has to be made into a pillow or wall hanging! I have a fun sewing project I’d like to share, too: a project bag excellent for embroidery projects, and easy to size up or down for other handiwork (crochet, knitting, small quilt piecing projects…) If you have any comments or requests, please leave me a note. I’m excited to share my love of embroidery with you!